As a family of four, living in Calgary (on mostly one income) we are really mindful of how we spend our money. We are also really conscious about saving money whenever we can. This means we often price shop, purchase ‘new to us’ items, and we are always looking at ways reduce our household expenses. In the past, in order to cuts costs, we have done things like eliminate cable television channels and re-negotiate prices for services such as internet and cable. When it comes to renegotiating services, I actually take a lot of satisfaction in being able to make a phone call and reduce our bills. In another lifetime, before my life as a mom to twins, I had a career in sales. I enjoy the negotiation process and I don’t ever hesitate to make those calls. 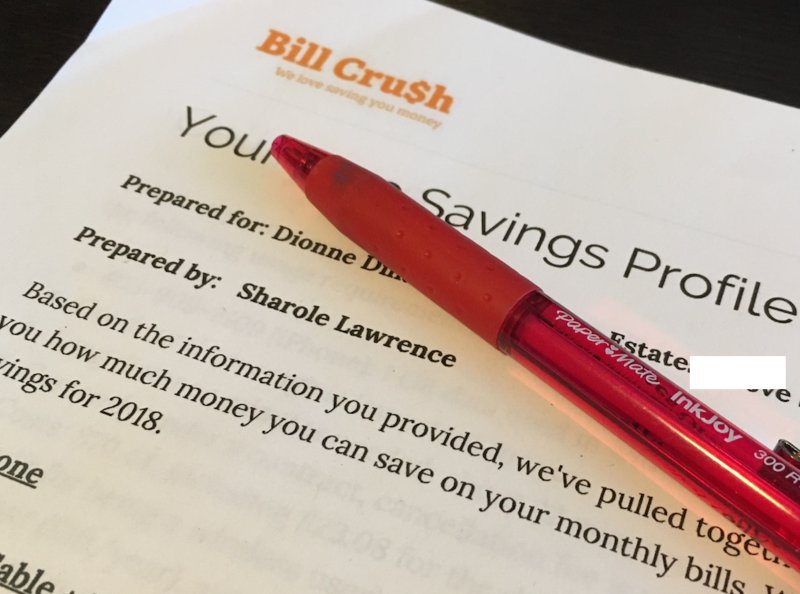 So, when I was recently contacted by Bill Crush to see if I might make use of a ‘Household Bills Audit’, I had my doubts about how much money they could really save me – I mean, I’m pretty on top of that stuff. But…their claim is that a typical family can save hundreds, if not thousands by switching to lower-cost service providers that they are able to recommend (their website indicates that they don’t receive commissions or referral fees from service providers, so you are presumably receiving an objective recommendation). 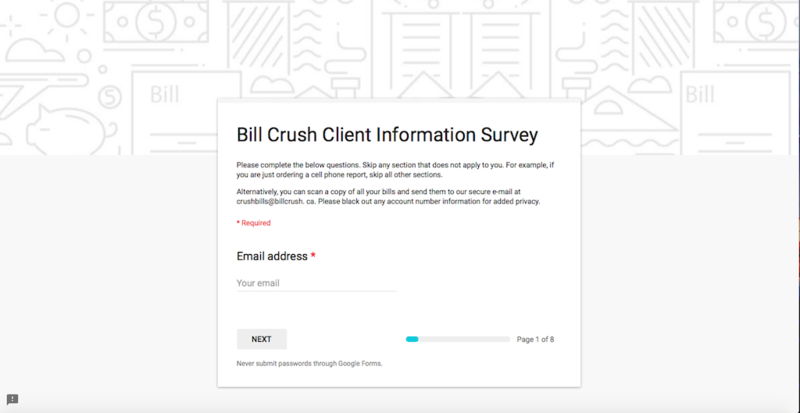 In case you’re wondering what Bill Crush is about, this is how it works. They are a company that does audits on Alberta family’s household bills. From there, they make recommendations on how to reduce the cost of them. Bill Crush charges a small fee (as low a $9.95) to audit your bill(s) and provide a savings report. They currently are focused on Alberta households and can audit any of the following services: TV/Cable, Internet, Home Phone, Cell Phone, Electricity and Gas. They offer a guarantee that if your estimated monthly savings doesn’t equal 50% or more of their fees, they will provide you with a discount. The first step was to send them one’s months worth of bills via scan/email. I was a little nervous about sending my bills with personal information, account numbers, etc. and they were very respectful of that. As an alternate option, they sent me a simple Client Information Survey to complete. Our household had a full audit done, which included: Cable tv, Internet, cell phone, home phone, natural gas, electricity. Completing the form was really easy. When I saw the list, I was worried it was going to take a long time, but really it did not. I collected my previous month’s bills and sat down and got to work. In order to make sure I completed everything as thoroughly as possible (because I really wanted them to be successful in finding me savings), I did also spent a small amount of time online, and also making a couple of phone calls. I spent about an hour and a half in total working on it. How many cell phones are on your plan? If you had to choose between excellent cell reception and a low cost, which is more important to you? Which natural gas provider do you use? Are you in a contract for electricity? What channels are important to you? My four-page report was sent within two days of me submitting my intake survey. 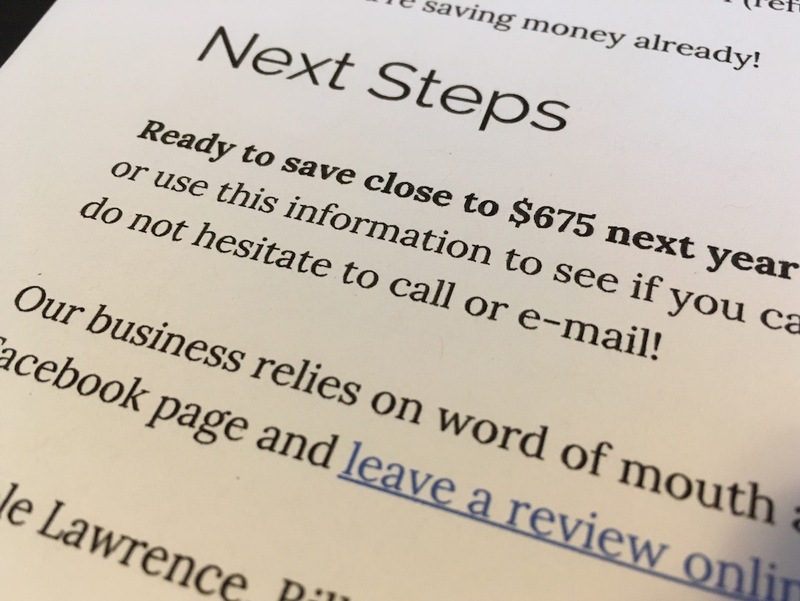 The cover page indicated that they had found about $675 in savings for 2018, so I was pretty excited to read what they had discovered and recommended for us. I was congratulated on getting a good plan/rate with my current cell phone provider, who apparently is known to be typically on the more expensive side (Yay me!). They did not, in fact, recommend me switching cell phone providers at all…instead, they gave me specific details about a competing provider to use as a negotiation tool to try to increase my data (which I indicated on my intake form I wanted to do) yet reduce my monthly bill. They also informed me why this alternate provider is credible and could be a good fit, in case I did decide to make a change). I LOVED this! I received a rate comparison between my current utilities provider, and a competing provider, that showed us a side by side comparison of rates AND a break-down of my estimated annual savings for 2018…and even beyond. I was shocked to discover an annual estimated savings of $475 Wowza! The report took into consideration any contracts that we are in and always considered cancellation fees that might apply. For those particular services, we received current comparable pricing for competing providers…helping us understand who to look at when contract expiry times come up. Honestly, I loved this report! This is exactly the kind of information I like to have (I am a total ‘details’ person) and has saved us so much time in research. Finding out the best competitor plans that are available to us that exactly meet our current needs was amazing! It provided clear and detailed changes we can make to save money ‘now’ and also later on…when some of our contracts come up for renewal. How YOU can save too! If you end up getting report of your own done, I would love to know how much savings they are able to find for you. I have seen some feedback from others that they were able to save in the ‘thousands of dollars’ range– perhaps it could be you! Disclosure: This review was sponsored by Bill Crush. As always though, all thoughts and opinions are my own.